Teacher Training – How does it work? Parents of young Downs’ Syndrome children are challenged by the multiple stresses of providing the full range of therapeutic care to meet their children’s special needs—at the same time that they must balance the logistics of caring for siblings and meeting the emotional needs of the entire family. 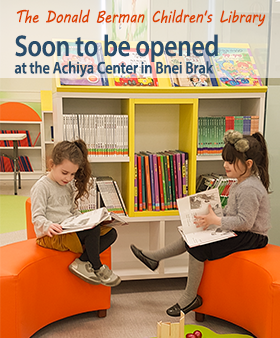 The greater Bnei Brak community (religious, traditional and secular families) turned to Achiya with a request. Would it be possible for Achiya’s specialists and therapists to offer care for their special needs children at the modern facilities of the Achiya headquarters? Achiya responded by creating a full-day program—Your Special Needs Day. 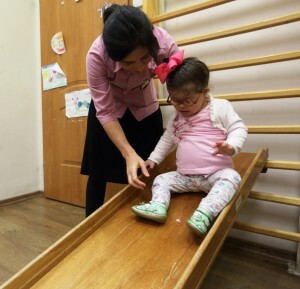 Children with Downs’ Syndrome receive an individualized program: speech, physical, occupational and hydrotherapy The program is for infants through children age ten—and includes the use of Achiya’s state-of-the-art hydrotherapeutic pool. The case worker assigned to each family also assigns therapists to help parents and siblings. The case worker tracks milestones achieved by the Downs’ Syndrome children and the progress of parents and siblings in coping with the special issues of their families. The Downs’ Syndrome Day Program was launched as a pilot in March 2014. Enthusiastic participation and feedback is leading Achiya to seek to expand the Program, which has become a warm, welcoming and shared space for parents of diverse backgrounds and lifestyles. Together, these families address shared challenges and help their special needs children and develop healthy and effective coping mechanisms. Core funding is provided by Israel’s health plans and the National Insurance Institute. Achiya works in collaboration with NGOs that serve Downs’ Syndrome children and their families. Achiya relies on philanthropic funding for the components of the program not covered by government funding—including the integrative work done by the caseworkers and workshops and two annual symposia for parents.